“We are designed by nature to flourish through play” Stuart Brown 2010Every CEO who has a customer born after 1971 needs to understand gamification. Organizations have invested decades in creating IT systems that automate business processes. Until gamification, little thought has been given to how these systems can motivate people to perform at their highest levels and fulfil underlying business goals; they are aimed merely at process execution. With the application of gaming principles and design to the way customer facing applications are composed and creating an environment of healthy competition, it is possible to change this. Make the customer experience fun, engaging and rewarding, luring customers to fall in love and stay in love with the applications. Destroy deployment times by running non-core functions, gamification and security perimeters in the cloud. We do this by turning the mundane into fun through the application of game design and game mechanics – the process known as Gamification. At the heart of what Gamification targets is the brain’s learning centre. Dopamine is a neurotransmitter—a chemical released by nerve cells to send signals to other nerve cells. It is released by the hypothalamus in response to stimulus and controls the brain’s reward and pleasure centers. This process enables us not only to see rewards, but to take action and move toward them i.e it is at the heart of how we become motivated. Research has shown us that three styles of events release dopamine and condition our brain – challenges, novelty and fun. By building these events into the customer experience we stand a much greater chance that the user will be motivated to participate. These fundamentas are why the Fitness App industry has been successful as have the great fun apps such as Angry Birds and Farmville. After decades building systems to automate businesses processes we are compelled to view the interface between people and machines with more than just scale and optimisation as outcomes. Where “ease of use” was previously the priority for application design, gamification approaches client design in more sophisticated ways, aiming to deliver business results by making “fun of use” a priority. 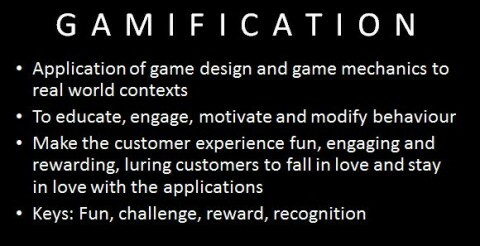 Gamification is focused on delivering top line business objectives such as revenue, customer loyalty, retention and brand marketing by leveraging years of research in motivational psychology and gaming. Working with the business to understand the business objectives, we collaborate to define what customer behaviours would create those outcomes. Applying motivational strategies we then gamify the customer experience to deliver those behavioral outcomes. We use this approach to manage customer behaviour, gently guiding their decision making, motivating them to use the systems more and invite their friends to play. Fundamentally about fun, gamification incorporates psychology, management, marketing and economics to take the player on a journey that rewards the player and our enterprise customers. What demographics can we target? People as young as toddlers and as old as pensioners play mobile games and from every social and economic background you care to imagine, playing 3 billion hours a week. Moroku is focussed on helping banks who are authentically focussed on helping customers who really need some help saving not spending. This means kids learning about money through to those paying off debt (cards, mortgages, auto and student) and preparing for retirement. In Insurance it’s about teaching people how to manage risk better in their lives and not just focussing on price at renewal. And in banking operations world wide we are taking mundane processes in the back office and adding attention, accuracy, staff attraction and retention. Moroku’s hypothesis, that well designed fun and rewarding mobile applications can build financial muscle, is validated by Nicholas Negroponte’s work with the One Laptop Per Child. organisation who are teaching hundreds of millions of children around the world to read and write without teachers or schools. Our plan is to teach hundreds of millions of people around the world to be better at managing their money without the need for bankers or wealth managers standing in the way.